I just learned about Catfish (the MTV series about online “dating”). 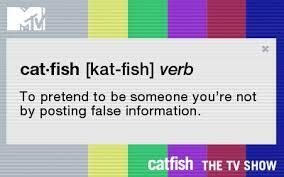 Urban Dictionary defines the term: A catfish is someone who pretends to be someone they’re not using Facebook or other social media to create false identities, particularly to pursue deceptive online romances. Being single is preferable to being with a catfish. I’m a genius. My IQ is 180. My dog was hit by one of the contractors working on my house. It was so bad; I just put her down right there. While I was skiing, everyone on the lift above me was cheering for me. You’re going to have to move to Salida. (Without ever meeting me) I could see myself marrying you. I just ate 25 Buffalo wings. I fart in my sleep. This entry was posted in Uncategorized and tagged Catfish, dating, MTV, single. Bookmark the permalink.